To make the dough, mix the egg, water and salt together in a large bowl. Add the flour gradually and knead thoroughly until a smooth, elastic dough is formed. Dust a surface with flour and roll out the dough to a thickness of 2mm, then use a 5cm biscuit cutter or glass to cut out circular pieces of dough. Combine the pork, beef, onions and 3 tablespoons water in a large bowl. Season with salt and pepper. Place a generous teaspoonful of filling onto a round of dough. Fold the dough over and pinch the edges to seal. You will be left with a crescent shape. Place the pelmeni on a tray sprinkled with flour and freeze them for at least 1 hour. 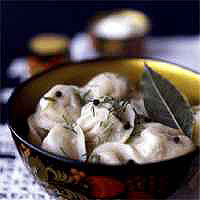 Pelmeni are best and traditionally cooked from frozen. Make some broth by bringing a large pan of water to the boil. Add half an onion, a sprinkling of salt, two bay leaves and a pinch of black peppercorns. Boil for 10 minutes. Remove the onion. Add a batch of pelmeni to the boiling broth, making sure that the water circulates freely around each one. They will initially sink to the bottom, but as the broth is brought back to the boil, the pelmeni will come to the surface. Continue to cook for 5 minutes, then serve, either in the broth or on their own with Russian vinegar, mustard or mayonnaise.